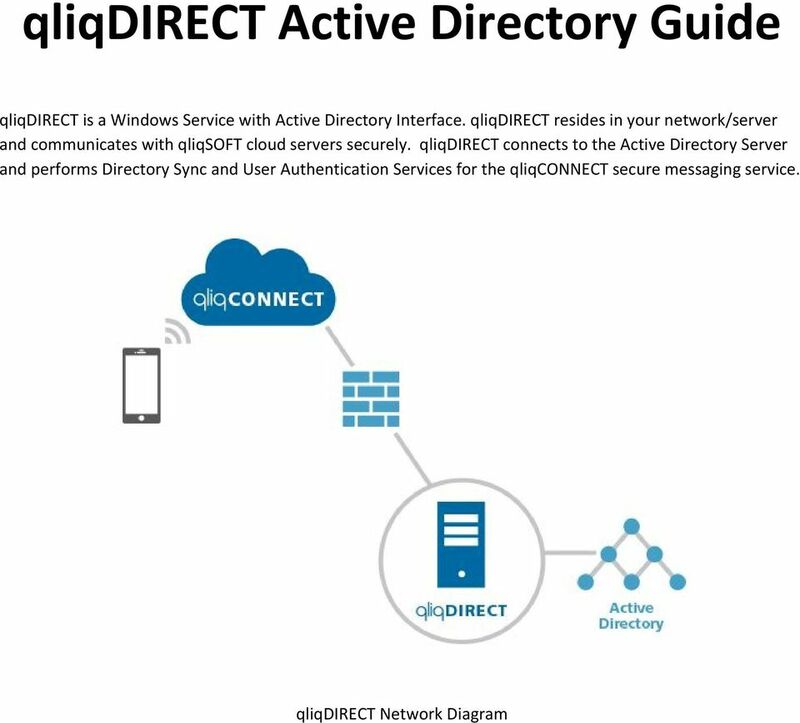 Download "qliqdirect Active Directory Guide"
2 Before you can use qliqdirect as Active Directory connector, you must first install qliqdirect on any Windows Server that can connect to Active Directory Servers. Installation 1. Download the qliqdirect from your qliqconnect Admin Web Console. 3 2. 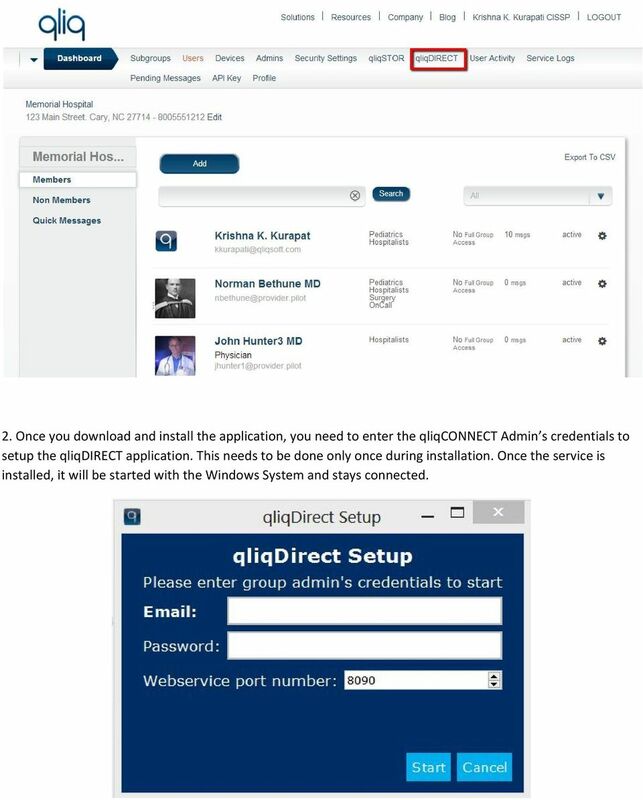 Once you download and install the application, you need to enter the qliqconnect Admin s credentials to setup the qliqdirect application. This needs to be done only once during installation. Once the service is installed, it will be started with the Windows System and stays connected. 4 3. The qliqdirect is a HTTP Server that takes the requests on Port 8090 by default. You can change the port to your choice. qliqdirect Active Directory Configuration Following screen show the qliqdirect Configuration when you launch qliqdirect Manager. You must enable the Active Directory integration before you can set the configuration. 5 Hostname : The domain or IP address of the Active Directory Domain Controller. This IP/Domain must be reachable. Username : The Active Directory Admin s username. This username you normally use to manage Active Directory Password : Password for the Active Directory Admin s username. Sync Group: qliqdirect queries Active Directory for all the users and groups belonging to the Sync Group. 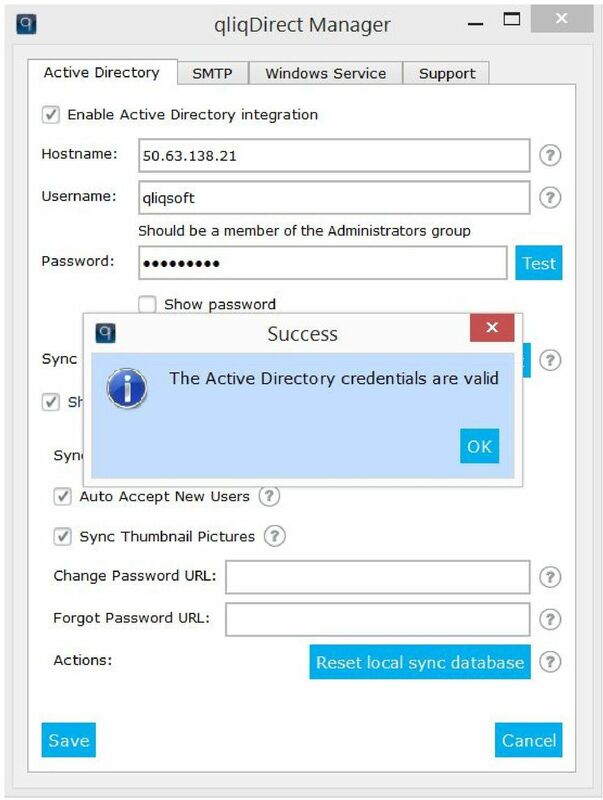 When you add an existing Active Directory group (Security or Distribution Group) to the Sync Group, the group as well as the members of the group are synced with the qliqconnect server. When you click on TEST button, you can see the sample results of the query that qliqdirect will perform to sync the users and groups. Please cross verify the results with the objects in the Active Directory. Before you proceed further, you should click on Test button next to Password and the Test button next to Sync Group to verify the settings. 7 Click on Show advanced settings to show the options below. 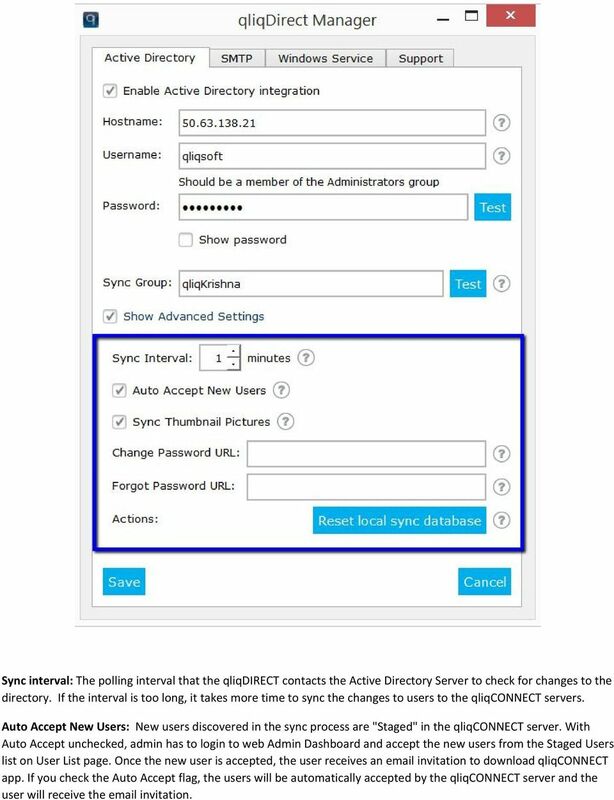 8 Sync interval: The polling interval that the qliqdirect contacts the Active Directory Server to check for changes to the directory. If the interval is too long, it takes more time to sync the changes to users to the qliqconnect servers. Auto Accept New Users: New users discovered in the sync process are "Staged" in the qliqconnect server. With Auto Accept unchecked, admin has to login to web Admin Dashboard and accept the new users from the Staged Users list on User List page. Once the new user is accepted, the user receives an invitation to download qliqconnect app. If you check the Auto Accept flag, the users will be automatically accepted by the qliqconnect server and the user will receive the invitation. 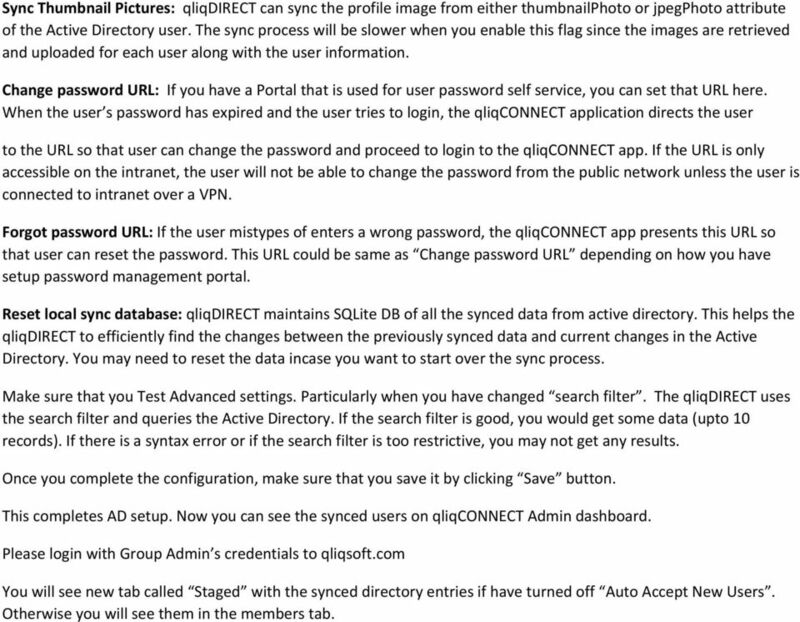 9 Sync Thumbnail Pictures: qliqdirect can sync the profile image from either thumbnailphoto or jpegphoto attribute of the Active Directory user. The sync process will be slower when you enable this flag since the images are retrieved and uploaded for each user along with the user information. Change password URL: If you have a Portal that is used for user password self service, you can set that URL here. 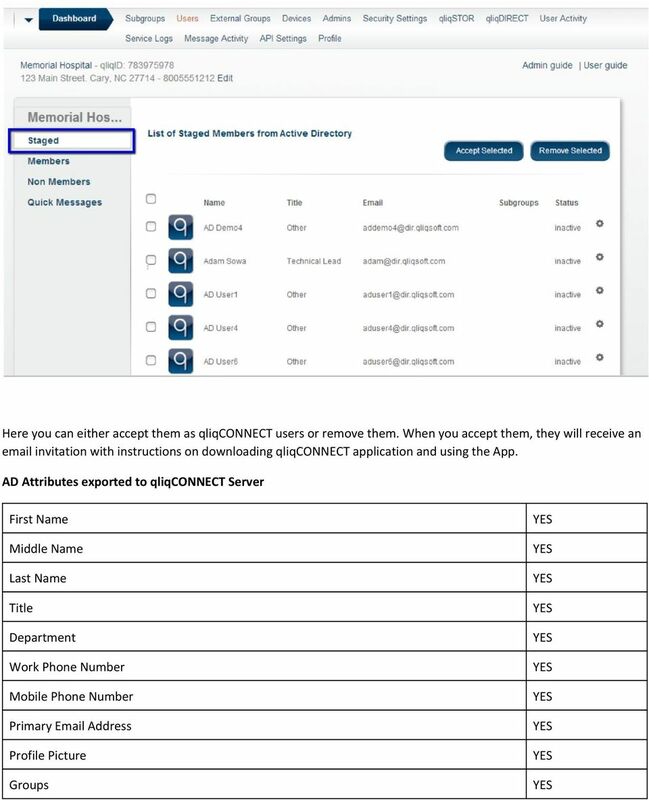 When the user s password has expired and the user tries to login, the qliqconnect application directs the user to the URL so that user can change the password and proceed to login to the qliqconnect app. If the URL is only accessible on the intranet, the user will not be able to change the password from the public network unless the user is connected to intranet over a VPN. Forgot password URL: If the user mistypes of enters a wrong password, the qliqconnect app presents this URL so that user can reset the password. This URL could be same as Change password URL depending on how you have setup password management portal. 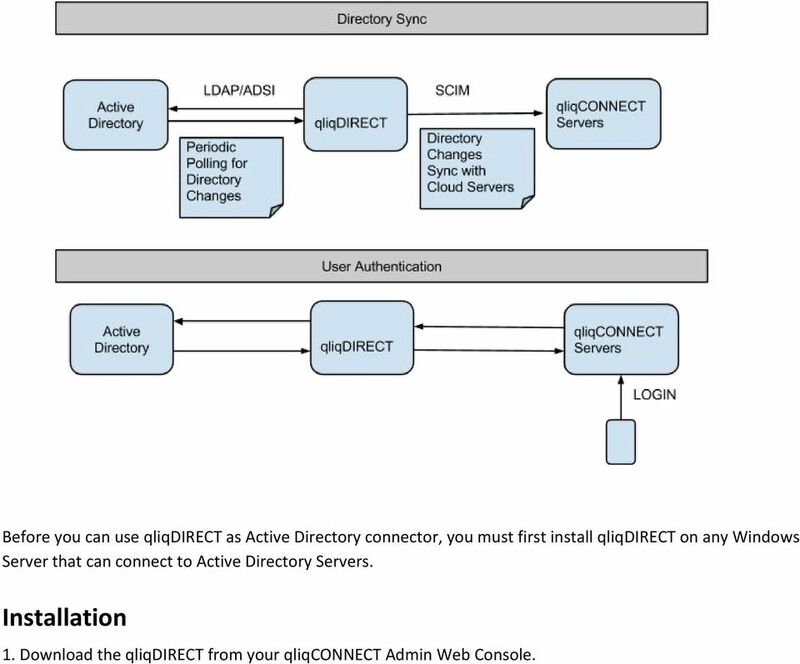 Reset local sync database: qliqdirect maintains SQLite DB of all the synced data from active directory. 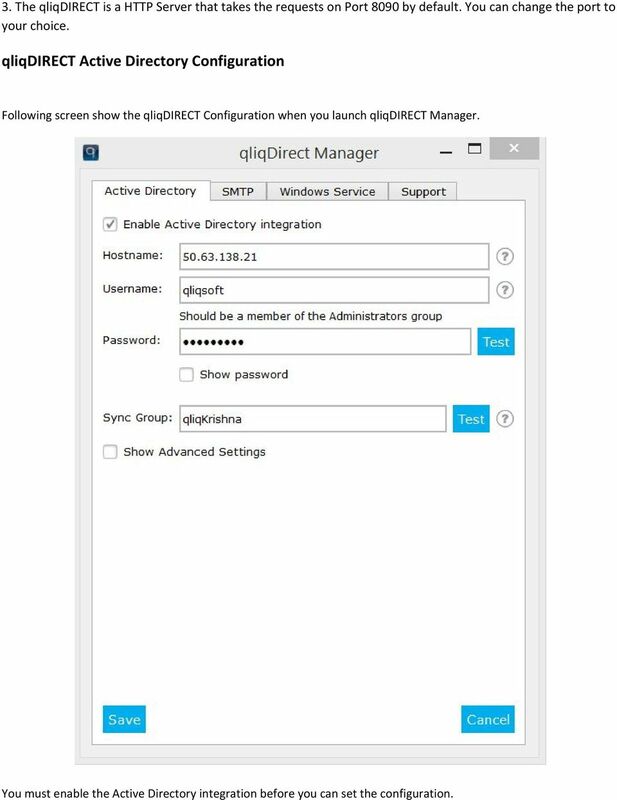 This helps the qliqdirect to efficiently find the changes between the previously synced data and current changes in the Active Directory. You may need to reset the data incase you want to start over the sync process. Make sure that you Test Advanced settings. Particularly when you have changed search filter. 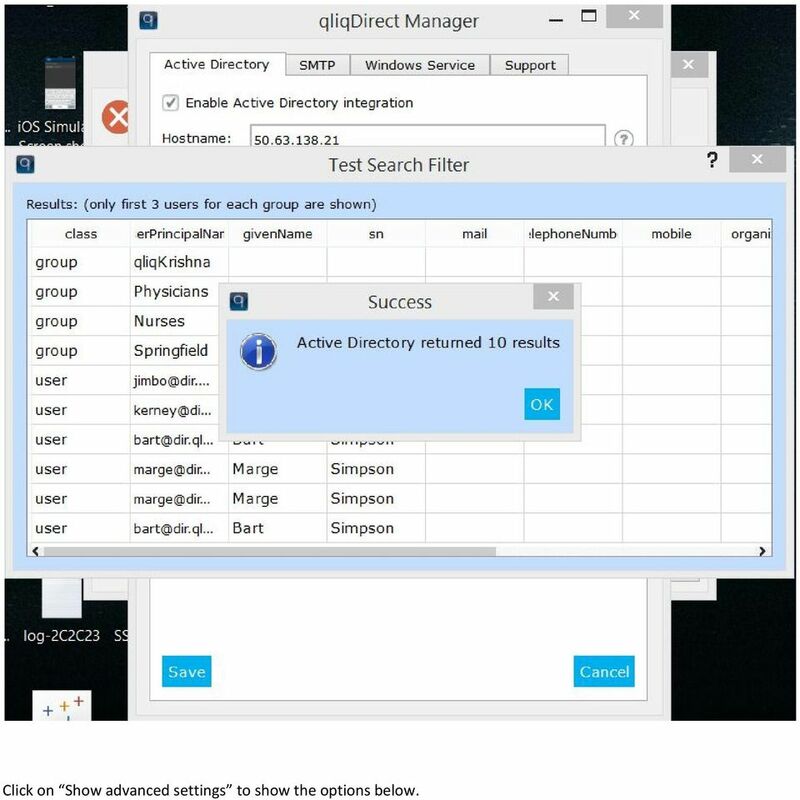 The qliqdirect uses the search filter and queries the Active Directory. If the search filter is good, you would get some data (upto 10 records). If there is a syntax error or if the search filter is too restrictive, you may not get any results. Once you complete the configuration, make sure that you save it by clicking Save button. This completes AD setup. Now you can see the synced users on qliqconnect Admin dashboard. Please login with Group Admin s credentials to qliqsoft.com You will see new tab called Staged with the synced directory entries if have turned off Auto Accept New Users. Otherwise you will see them in the members tab. 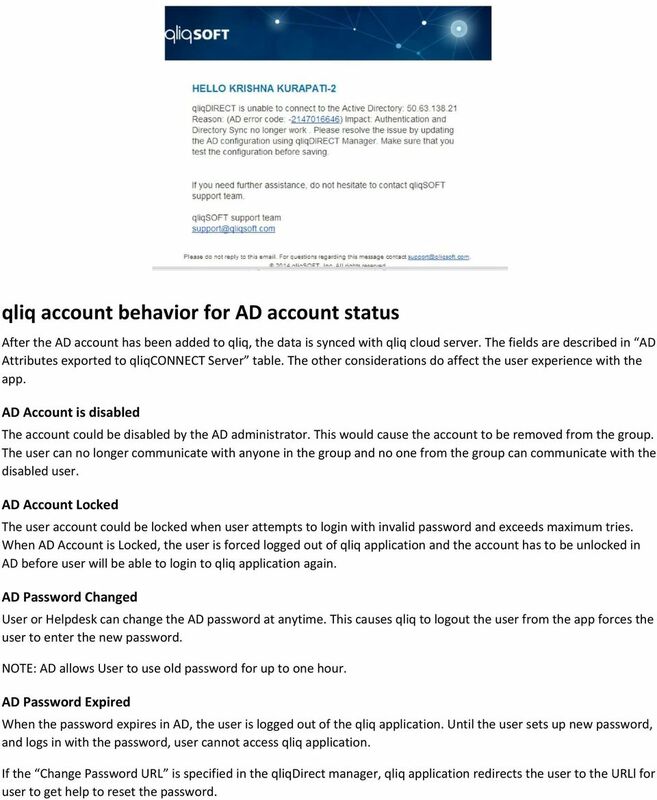 12 qliq account behavior for AD account status After the AD account has been added to qliq, the data is synced with qliq cloud server. The fields are described in AD Attributes exported to qliqconnect Server table. The other considerations do affect the user experience with the app. AD Account is disabled The account could be disabled by the AD administrator. This would cause the account to be removed from the group. The user can no longer communicate with anyone in the group and no one from the group can communicate with the disabled user. AD Account Locked The user account could be locked when user attempts to login with invalid password and exceeds maximum tries. When AD Account is Locked, the user is forced logged out of qliq application and the account has to be unlocked in AD before user will be able to login to qliq application again. AD Password Changed User or Helpdesk can change the AD password at anytime. This causes qliq to logout the user from the app forces the user to enter the new password. NOTE: AD allows User to use old password for up to one hour. AD Password Expired When the password expires in AD, the user is logged out of the qliq application. Until the user sets up new password, and logs in with the password, user cannot access qliq application. If the Change Password URL is specified in the qliqdirect manager, qliq application redirects the user to the URLl for user to get help to reset the password. 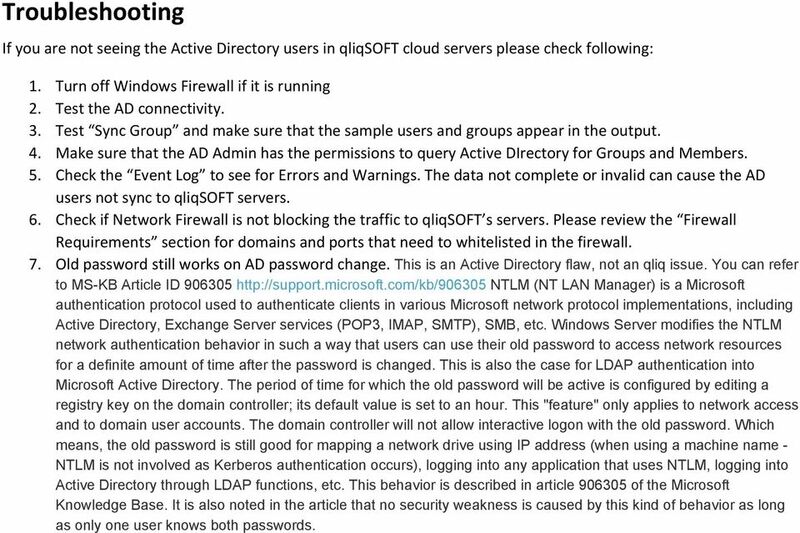 13 Troubleshooting If you are not seeing the Active Directory users in qliqsoft cloud servers please check following: 1. Turn off Windows Firewall if it is running 2. Test the AD connectivity. 3. Test Sync Group and make sure that the sample users and groups appear in the output. 4. Make sure that the AD Admin has the permissions to query Active DIrectory for Groups and Members. 5. Check the Event Log to see for Errors and Warnings. The data not complete or invalid can cause the AD users not sync to qliqsoft servers. 6. Check if Network Firewall is not blocking the traffic to qliqsoft s servers. Please review the Firewall Requirements section for domains and ports that need to whitelisted in the firewall. 7. Old password still works on AD password change. This is an Active Directory flaw, not an qliq issue. You can refer to MS KB Article ID NTLM (NT LAN Manager) is a Microsoft authentication protocol used to authenticate clients in various Microsoft network protocol implementations, including Active Directory, Exchange Server services (POP3, IMAP, SMTP), SMB, etc. Windows Server modifies the NTLM network authentication behavior in such a way that users can use their old password to access network resources for a definite amount of time after the password is changed. This is also the case for LDAP authentication into Microsoft Active Directory. The period of time for which the old password will be active is configured by editing a registry key on the domain controller; its default value is set to an hour. This "feature" only applies to network access and to domain user accounts. The domain controller will not allow interactive logon with the old password. Which means, the old password is still good for mapping a network drive using IP address (when using a machine name NTLM is not involved as Kerberos authentication occurs), logging into any application that uses NTLM, logging into Active Directory through LDAP functions, etc. This behavior is described in article of the Microsoft Knowledge Base. It is also noted in the article that no security weakness is caused by this kind of behavior as long as only one user knows both passwords. Getting Started Guide Revision A McAfee Directory Services Connector extension For use with epolicy Orchestrator 4.6.1 through 5.0 COPYRIGHT Copyright 2013 McAfee, Inc. Do not copy without permission. What is the Barracuda SSL VPN Server Agent? In this topic we will cover the security functionality provided with SAP Business One. Administration Guide. . All right reserved. For more information about Specops Password Sync and other Specops products, visit www.specopssoft.